"The Earth has all the time in the world. And we don't." Nicole and I recently watched The 11th Hour and I have decided to do something fun. I need your help to carry out a project. 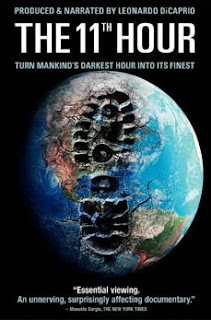 I was so moved by the film that I went and purchased 11 copies of Leonardo DiCaprio's documentary about how human beings are pushing ourselves to the brink of extinction. I will send or hand these DVDs to the first 11 people who contact me to request one. You request a copy of the movie. I send or hand-deliver one of the eleven copies of the DVD to you. The DVD is not yours to keep, but I don't want it back (I have my own copy which I intend to watch several times). After you and your loved ones have watched the movie, you need to pass it on to someone who you think could benefit from watching it. Or who you think will enjoy it. I'm sure you know someone who will be affected by a powerful, inspirational film with many, MANY ideas of how we can get out of this mess. Once the next person receives the movie, I need that person to contact me with the copy # of the DVD, their name and zip code (I will add them to this Google Map, and once they are done, they need to pass it on, etc. This is sounding like a chain letter or one of those goofy emails that promises that you will win the lottery if you pass it on to 20 people within 10 seconds of reading it. This is nothing like that, but the payoff of spreading the word about how we can individually behave more responsibly is huge... and necessary if we want our descendants to have clean drinking water, polar bears, and breathable air. Maybe we should scale back the interest in exploring and building subdivisions on Mars, and start exploring new ways to live right here on the planet we were born on. Solving the climate crisis is not just about governmental mandates. Although those will affect major change, so will individual local efforts by every single person who chooses to live differently. This is not about being a tree-hugging hippie. It's about not buying the cheapest possible item every time you need to buy an item. At this point in history, that item was probably manufactured in terrible working conditions by workers with no benefits and miniscule income, and the factory is probably polluting the drinking water of its workers' villages. It's about eating food produced locally, and it's about turning your back on the disgusting gluttony that has engulfed the American mindset. It's about using natural products to control the weeds in your lawn, if you even care to have a lawn. Solving this crisis requires a complete overhaul in the way we think, in the way we do, and in the things we consider to be goals in life. We need to overhaul our manufacturing processes to the Bill McDonough plan of Waste Equals Food. All you have to do is be one of the first 11 people to email me and we can get this thing started. Think of this as Netflix, except you are not sending the movie back to the place you got it from. Instead you are participating in an effort to Affect Change, by sending it on a journey to a person you know and then a person that person knows, and on and on. I will update this map to show where each copy travels to. You request one of the eleven copies of The 11th Hour that I have purchased for this project. You must give me your Name and Address in order to receive your copy. How else can I deliver it to you? I will send or hand you the movie. Let me know how many people you watched it with and what copy of the movie you have. I will keep track of everything on a subsequent blog post. Send the movie on to someone you think will benefit from it, letting that person know how this works. (They can also read the instructions that will accompany the DVD). Working together, we can get a lot of people who may never have heard of this movie to see it, think about it, and spread the word to someone they know. This is a really great idea, and I twittered it to my network (hope you don't mind). Just sent you an email with address info. I look forward to watching the progress of your project. I am in Susan's twitter network, I would love to be part of this. I have a new course this fall, environmental science for freshman. When I read your post I thought of sharing this with the teacher of the course and having a group of students create a wiki or blog about their reaction to the film and what they can do in their own lives to make a change. I would love to give this a try. This project is off to a quick and exciting start. The dvds have not all been distributed yet. That being said, please be sure to click one of the above email links to put in a request. (This does not apply to the two commenters to this point, who have both emailed me)... Just want to be sure I don't miss any requests if they are only put here in comments. Thanks to everyone who has participated so far, I have a feeling this is the beginning of a pretty exciting project with a lot of innovative ideas to come of it. I just got done watching it. I think this is a great project and I hope it gets into as many hands as possible. I think the real goal is to try to get someone who is on the fence or someone who is not as passionate as I know Ryan and myself are to watch it. I know we are doing enough, but we need to get the average person to do more. Thanks, Ryan, for creating this project. We watched “The 11th Hour” and for the first time in years felt that unmistakable sense of moment that is history in the making. We are seeing the symptoms of crisis in our day to day and gradually acclimating ourselves to needed change. Yet this film concentrates the data, puts it in context, and makes it real and immediate. We shared the DVD forward to friends as soon as possible. Details about the project of 11th our as you write about that here this is pretty interesting from people get awareness. Students get rid from writing problems with hire of essay shark service that charge cheaply from their users.